The story is simple and sweet: an aging and lonely Chinese mother, suffering from empty nest syndrome, receives an unexpected second chance at motherhood when her homemade dumpling comes to life. Disney Pixar has now released the short trailer and first glimpse of its much-awaited short film 'Bao', made by Chinese-Canadian director Domee Shi, the animation giant's first female director of an animated short . The veteran storyboard artist (and self-professed eating enthusiast) describes her culinary fable as a "magical, modern-day fairy tale, kind of like a Chinese Gingerbread Man story". "It explores the ups and downs of the parent-child relationship through the colourful, rich and tasty lens of the Chinese immigrant community in Canada," Pixar said in an official statement. "Mom excitedly welcomes this new bundle of joy into her life. But Dumpling starts growing up fast and she must come to the bittersweet revelation that nothing stays cute and small forever." Should you go loco for Pixar's Coco? How did Disney get Moana so right and Maui so wrong? Ms Shi's mother, a Chinese-Canadian immigrant, also served as a "cultural consultant" on the film. 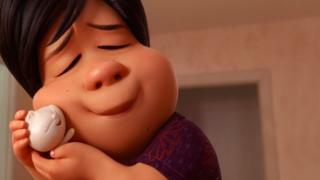 Her dumpling-making skills were put to superb use, ensuring that the movie's animated dumpling-making scenes were as accurate as possible. Pixar short films generate as much buzz as their feature length offerings and they are pored over in great detail, sometimes proving controversial. Lava, the short that was screened before the Pixar blockbuster Inside Out, told the tale of a male and female volcano somewhere in the Pacific that fall in love. Many viewers spoke out dismissing the storyline, but its gender representation and even its geological integrity came under fire. Its latest feature animation Coco was also closely examined after years of cartoon stereotypes of Mexicans and Mexican culture. The question of representation of Asian talent in the entertainment industry has also been a major concern for many. Hollywood has been accused of failing to offer roles to Asian or Asian American actors, even when the part is an Asian character, the so-called "whitewashing" of Hollywood. Is Scarlett Johansson casting Hollywood 'whitewashing'? So for fans getting a first glimpse of the trailer on Instagram, the overwhelming expression was one of joy, not least because this was made by an Asian woman, the first to direct for Pixar. "Very excited for this short because it's coming from Pixar's first female Asian director. I can tell that it will be very emotional. Can't wait," said fan Abby Berlage. "Two of my favourite things, baos and babies," said another Instagram user Lindsey Worley. One Instagram user observed similarities with another Asian animation. "This new Pixar short reminds me of Huba from Monster Hunt," wrote Justine Walker, referring to the massive 2015 Chinese hit. Others aired their thoughts about the quirkiness of Ms Shi's edible dumpling baby. "Cute but terrifying at the same time," remarked one Instagram user. "What if you were eating soup dumplings (xiao long bao) one day and it suddenly springs to life?" Others ruefully read the complexity of the immigrant experience into the dumpling fable. "Prequel: he finds out he is not a pure dumpling. His Dad was a soup dumpling so he doesn't quite identify with either. Instead, he wants to be a gyoza," Tracy Almeda-Singian posted on Twitter. Reporting by the BBC's Heather Chen. Should you go loco over trailer for Pixar's Coco? Trump tried to get Special Counsel Mueller fired, the just released report into alleged Russia collusion says.